Sometimes failures teach you more than successes. Why am I getting philosophical on a food blog? This recipe didn’t turn out as expected. Why? The cheese did not melt into the soup; instead, it melted into cheesy lumps throughout the soup. The ingredients I used were 1 small chopped onion, 1/2 teaspoon minced garlic, 1/4 cup melted butter, 1/4 cup flour, 2 cups milk, 2 cups chicken stock , 1 pound fresh broccoli, 1 cup carrots, 1/4 teaspoon nutmeg, 8 ounces grated mozzarella, and salt. I sautéed the onion in the melted butter. I added some salt, nutmeg, and garlic at this point as well. I cooked it until the onion was soft. Once the onions had softened, I added flour and stirred it over medium heat for a few minutes. I gradually added the milk, stirring constantly. 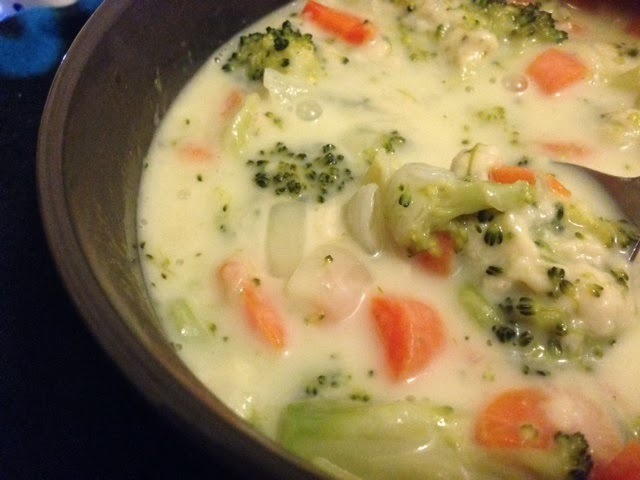 Once there were no lumps of flour and the milk was completely combined, I added the chicken stock. I let this simmer for 13 minutes. Then I added the chopped broccoli and carrots. I cooked the soup on low heat for 20 minutes. I then added the grated mozzarella cheese. This is where things started to go array. The cheese didn't amalgamate with the soup. I instead had stringy bits of cheese throughout the soup. I did a little google search to see what had gone wrong. A common mistake when melting cheese is too much heat. According to Fine Cooking, too much heat causes the proteins to seize, and you’re left with globs of cheese which have had their liquids and fats squished out. The article suggests grating the cheese, bringing it up to room temperature, and using low heat. I don’t think my problem was high heat. The two recipes asked for cheddar. The article says you should choose a cheese you know well or use exactly what the recipe indicates. Each cheese melts differently. The have three cheese groupings: stringy or stretchy melters, smooth melters, and nonmelters. Cheddar melts smoothly while mozzarella is stringy when it melts, which is why you should use cheddar in soups and mozzarella on pizza. Unfortunately, I only researched this issue after I had stringy broccoli soup. Oh well! I still ate all of it, and the flavor was good. Cheddar would have melted into the soup, and it has a stronger flavor, which would have stood up better against the other flavors. This is the BEST post! I love your honesty and thank you for the research. None of us will make this mistake thanks to you. 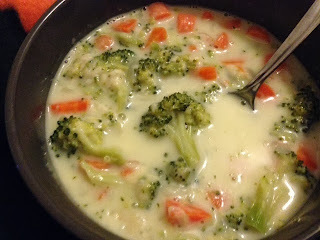 I love broccoli cheddar soup. Thanks! I learned a lot, even if it didn't turn out.